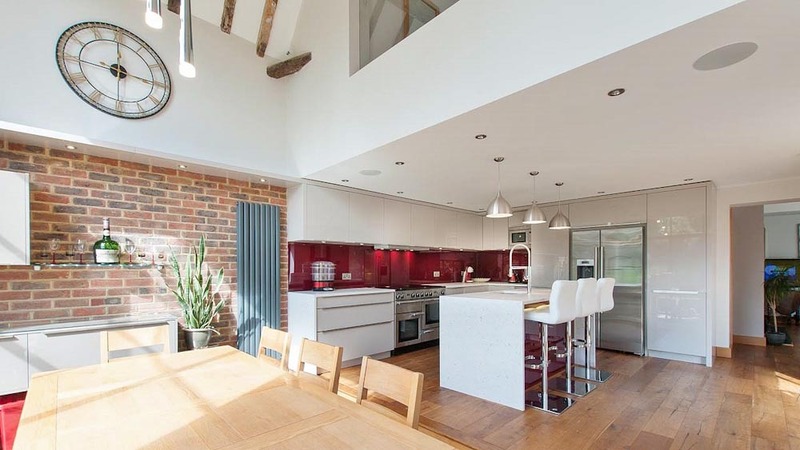 The kitchen was set within a split level mezzanine over-looking a double storey Crittall glazed wall. The clients wanted the kitchen on the upper level and the dining area on the lower. They also wanted an island with seating for three people and they were very keen on having an American fridge and range cooker. The layout design integrated the kitchen with the dining area on the lower level. 50mm framing runs the entire length of the room which flies in with the lower section to which we added lights illuminating the exposed brickwork, underneath we designed a drinks bar. One of the key elements was to integrate the American fridge and the range cooker. To ensure this worked well, two larder cupboards were added either side of the fridge and one above, making this symmetrical. The range cooker is centred between two 120cm drawer units. In the corner we fitted in a 30cm wine cooler and a built in wall unit microwave. The overall effect being a beautiful kitchen with a generous amount of storage and a high degree of functionally. The island housed the sink, dishwasher and pull out bins for waste and recycling. The finishes we used really set the kitchen off. 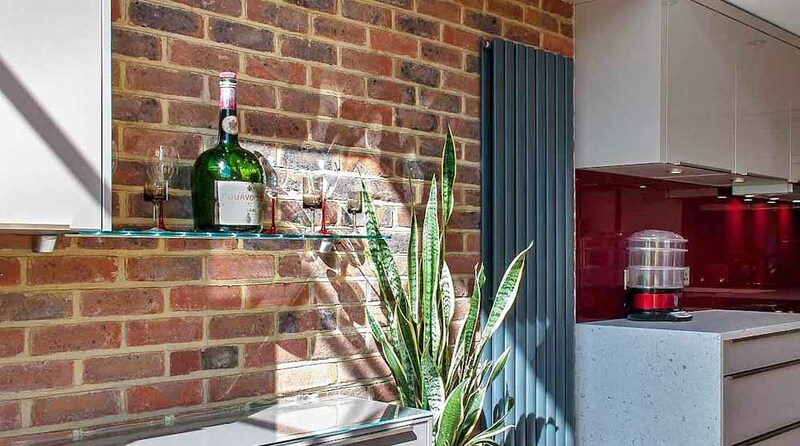 The worktops are volcano Silestone Bianco Rivers with a beautiful tactile finish, which when set against the vibrant burgundy glass splashback which really brings the kitchen to life. 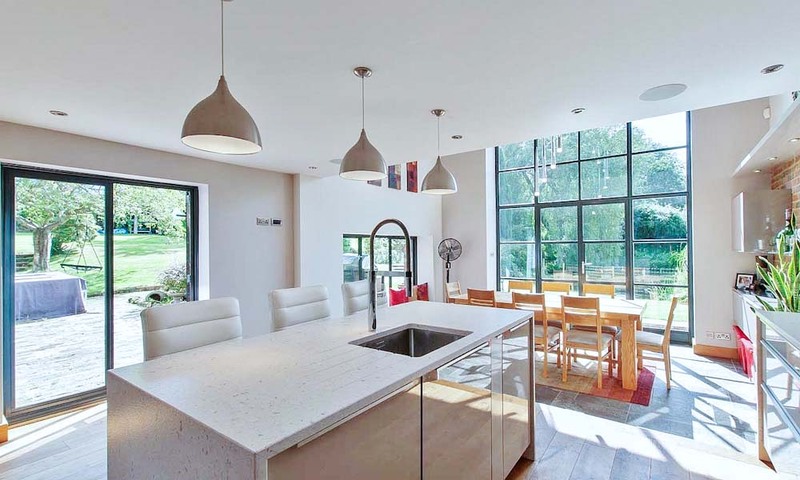 The end result is a kitchen that is as visually stunning as it is practical. The use of such varied finishes and textures creates an organic feel to the space. 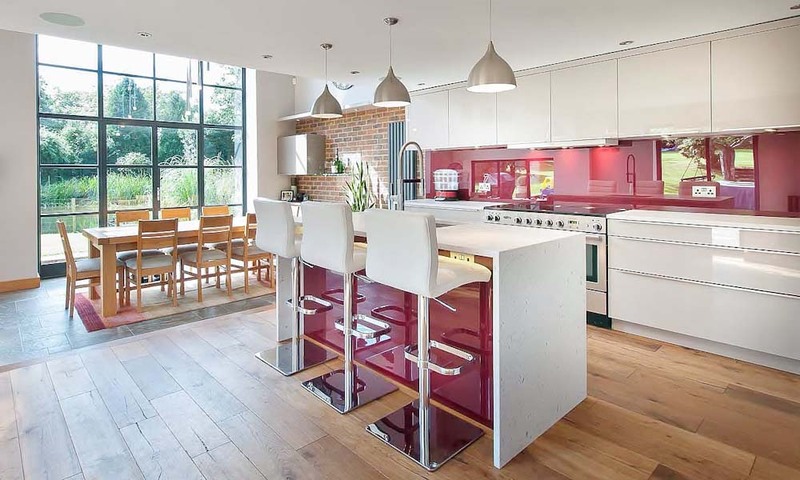 From a technical perspective the quality of the installation coupled with the high quality German cabinetry and German appliances mean the kitchen will stand up to years of use. It is a privilege to work with clients who have both the vision and belief to try things that are a little different, but as can be seen by the photos the results are truly stunning.